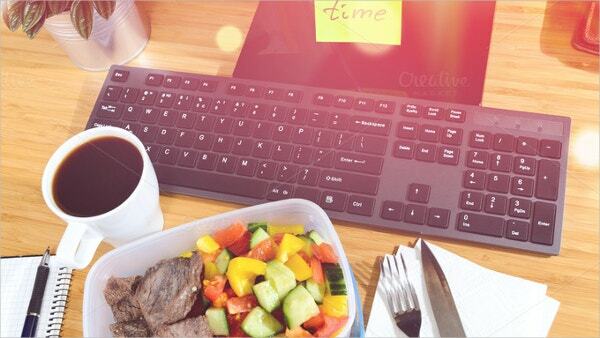 Planning for meals is among the tough duties that you cannot avoid in life. Individuals and families often find the need to prepare healthy meals especially when they are dieting. Pregnancies and some medical conditions such as diabetes also demand healthier meals. For such reasons, you may want to use Plan Templates. They aid in planning for shopping food items and preparing for your daily, weekly or monthly meals beforehand. 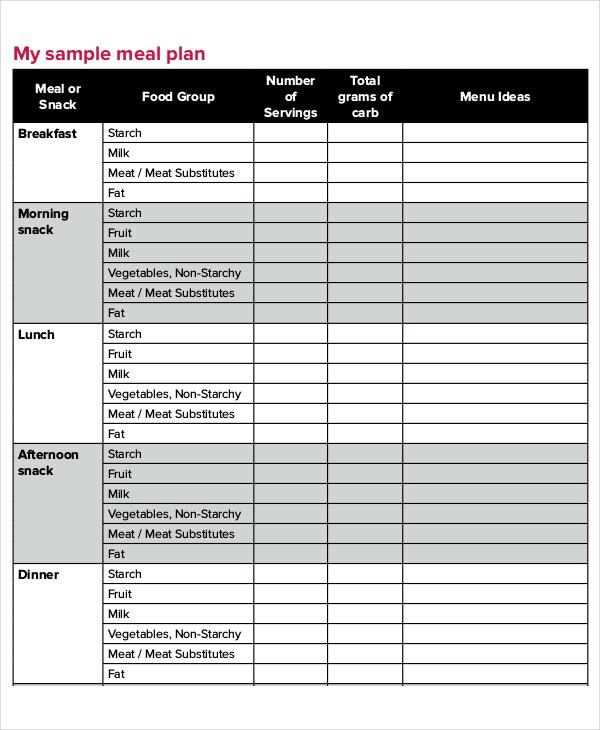 Use the weekly meal plan template for dieting. 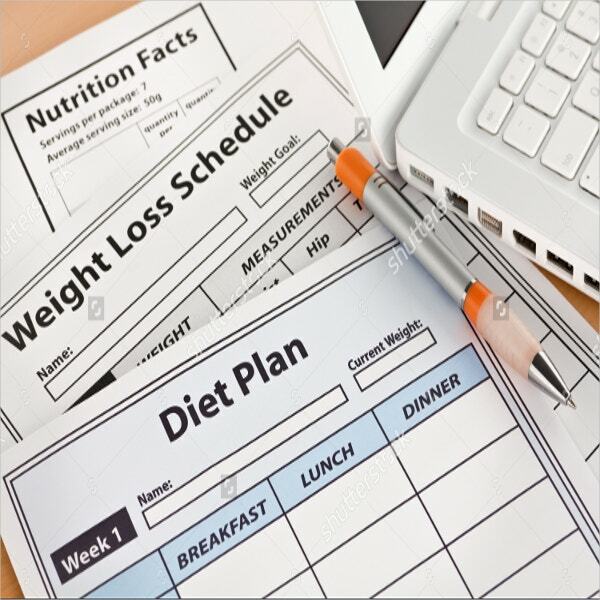 The downloadable vector file that is ready for printing at high resolution contains a blank diet plan page. 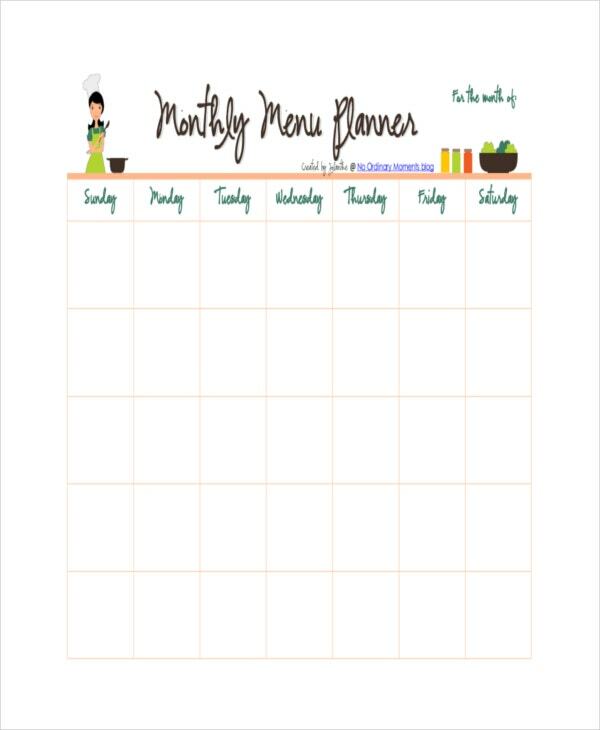 The monthly menu planner for download in PDF format is ready for printing. It contains customizable calendars in professional design with blank boxes for you to plan your meals. 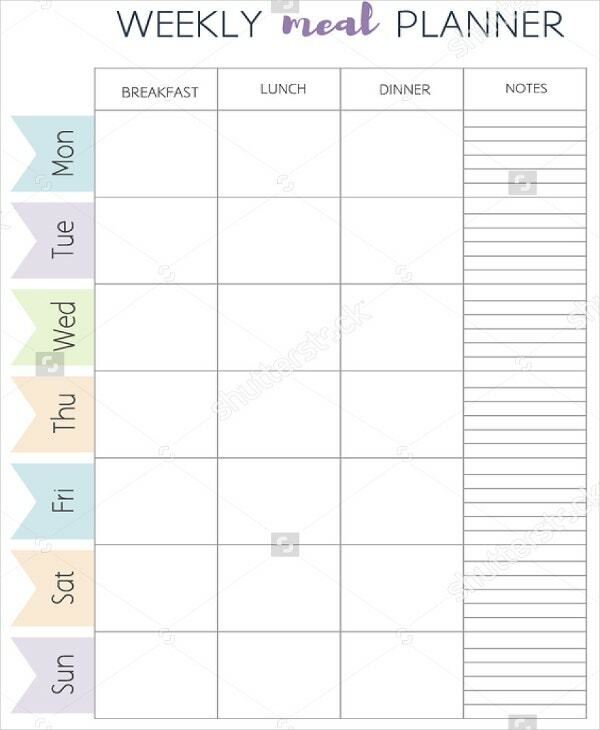 The weekly meal planning schedule template comes in A 4 format. The editable and customizable vector at a high resolution contains empty boxes for breakfast, lunch, and dinner for the week. 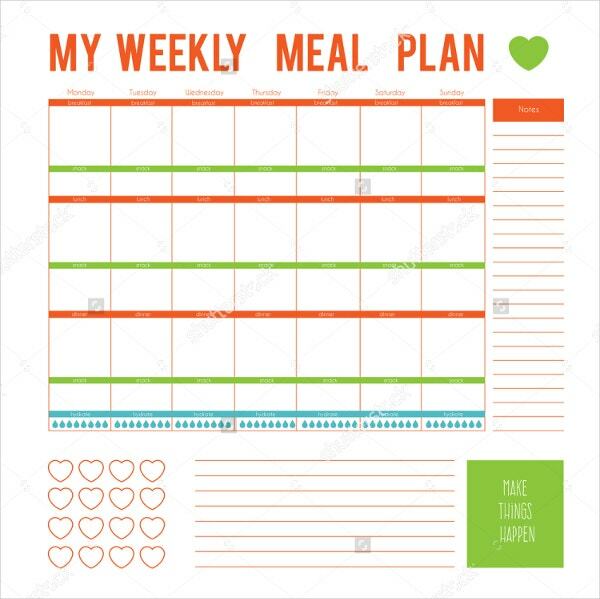 Use the Meal Planning Template with Grocery list to healthily plan your weekly meals. It contains menu planning tips, a menu planner and a detailed grocery list for your shopping needs. Use the healthy diet plan to plan for your protein-rich foods. This template works best for persons undergoing fitness programs. It is easily editable, printable, and downloadable at high resolution. 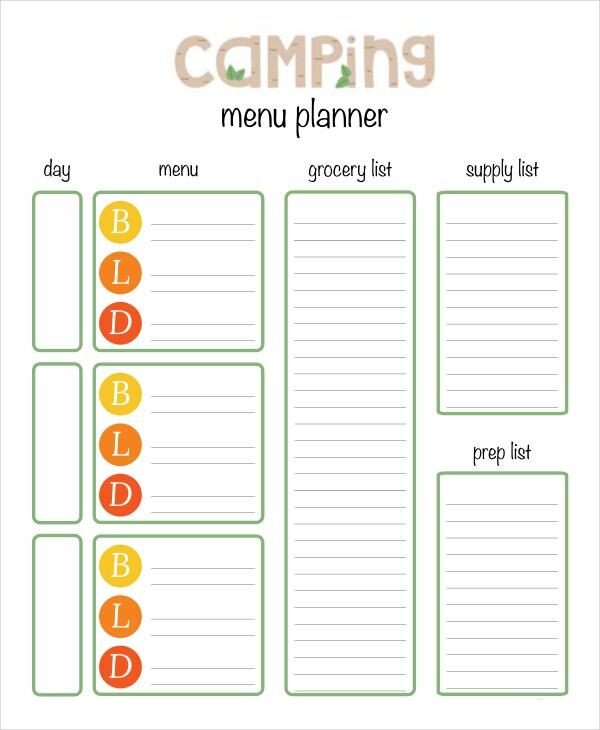 The Family Dinner Schedule Template features a calendar entailing plan for all meals of the day. It features editable fruit images and fonts on a clean white and background. It is downloadable for printing in PDF format. 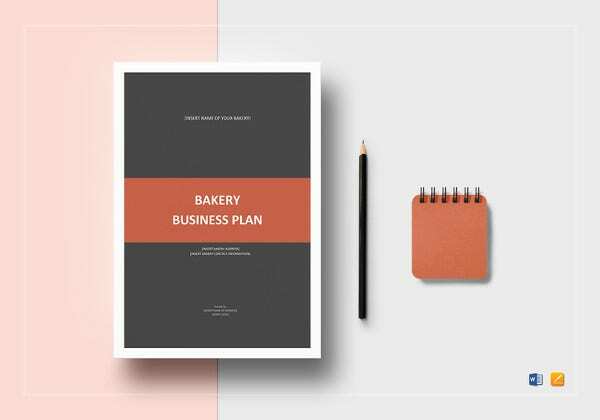 > When should you use Meal Planning Templates? You cannot limit the occasions when Meal Planning Templates prove to be useful. This is because they become essential when one realizes that one ought to start living healthily. 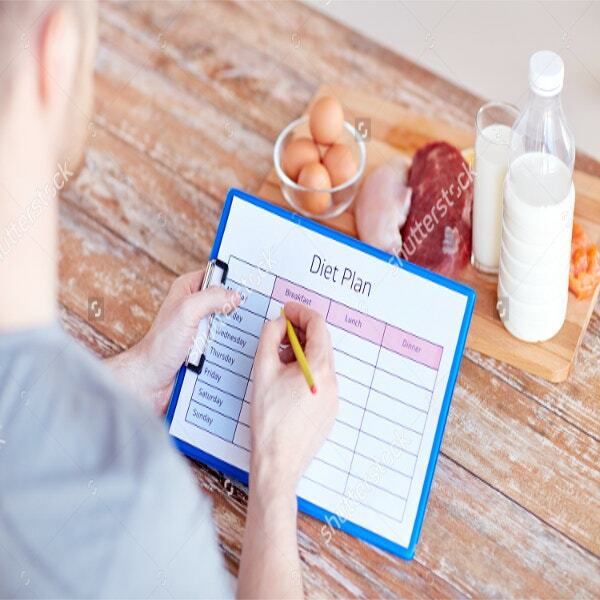 Note that you will want to use meal planning templates during your fitness program, lactation & pregnancy period and recovery from surgery or any other medical operation. Some individuals use them when shopping for their monthly, weekly, and daily groceries. In addition, you can use them in preparing your meals. This is because they define the foods that you intend to prepare in a given way alongside all the vital ingredients. 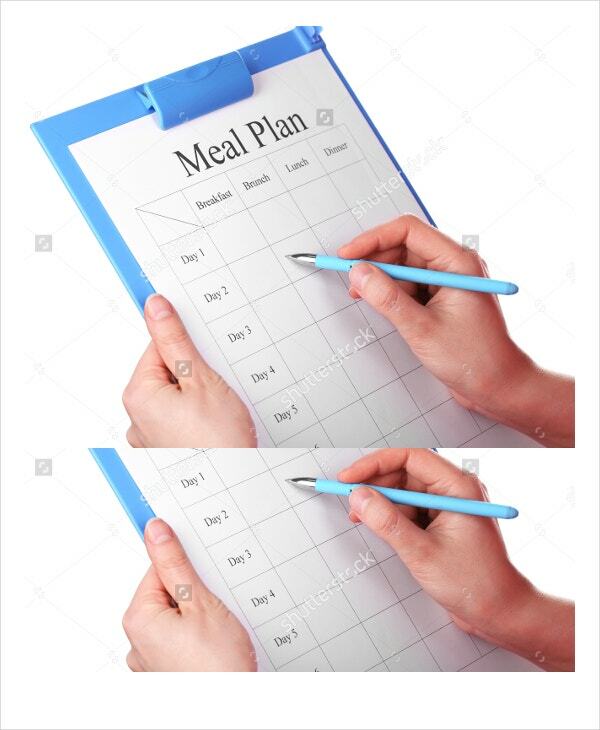 The meal planner for sports trainer comes with a meal program for several days on a patterned white background. You can download, share or print these editable schedule templates. 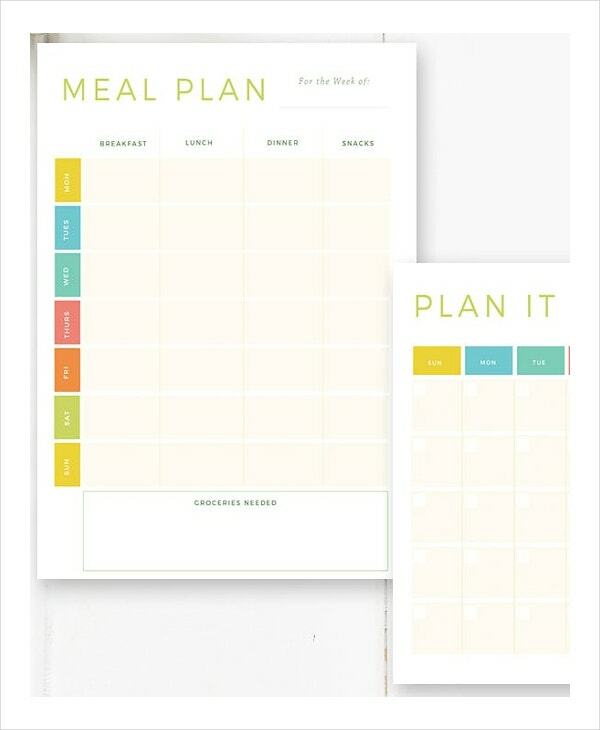 The meal and menu planning kit for purchase allows you to organize your weekly or monthly household meals. These schedule templates for download in PDF format contain freezes, inventories, favorite, and grocery list templates. 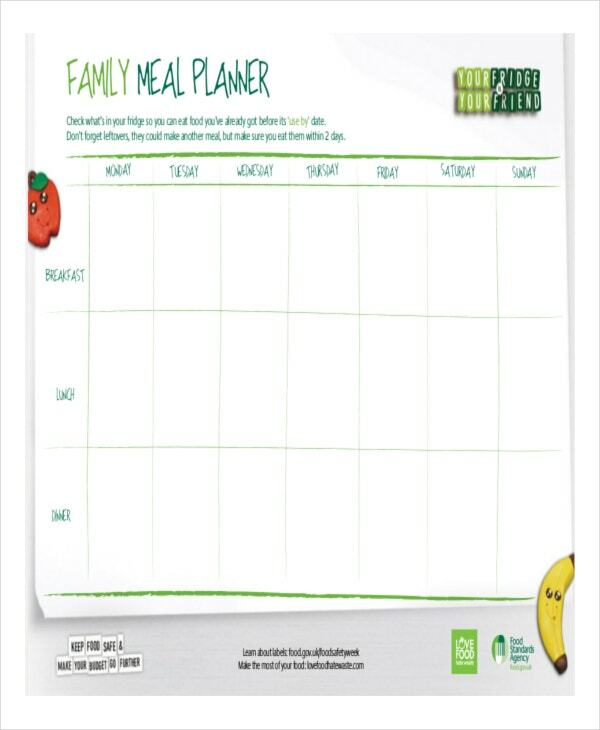 Use the meal planning schedule template to design healthy food programs for your family. It features major meals and snack options for specific days. 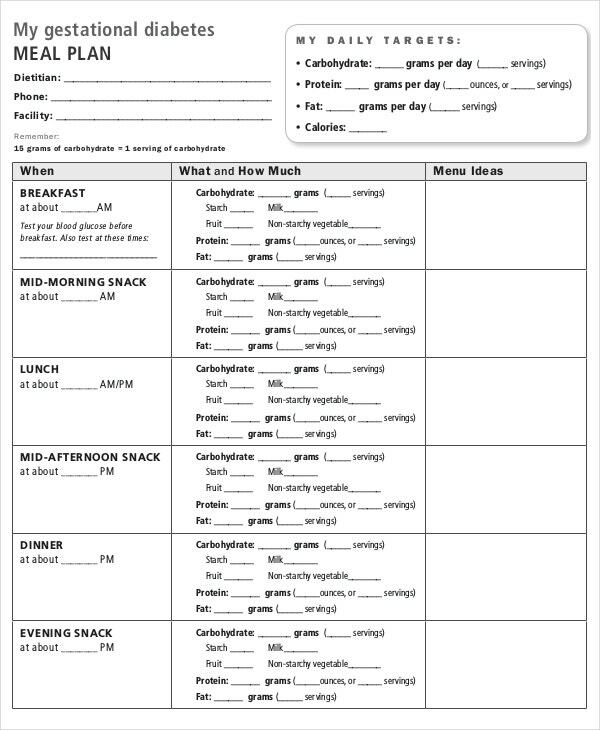 Download the dinner schedule template for weight loss that contains documents diet plans, weight loss schedule, and nutrition facts. 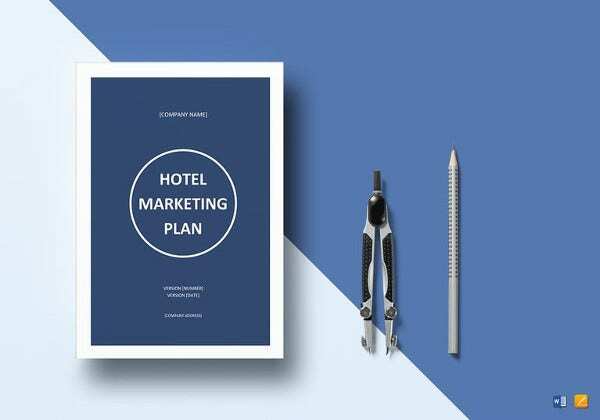 The printable and downloadable file comes at a high resolution. My diabetic meal plan during pregnancy is available for download in PDF format. It features a dieting advice meal plan, carbohydrates counting and serving sizes, and individual meal plan. You can easily customize its meal plan sample. 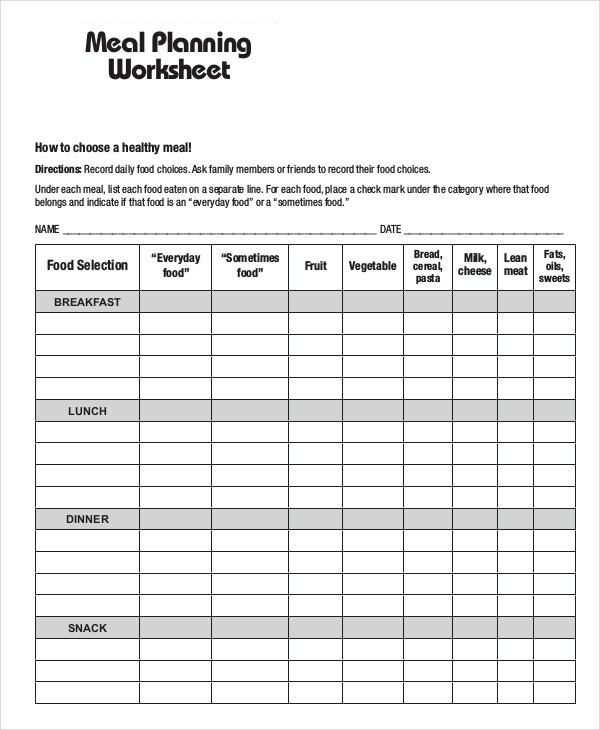 Use the gestational diabetes menu planner to plan your healthy meals wisely. The editable sample plan contains a meal plan with respect to calories for major food nutrients including fats. 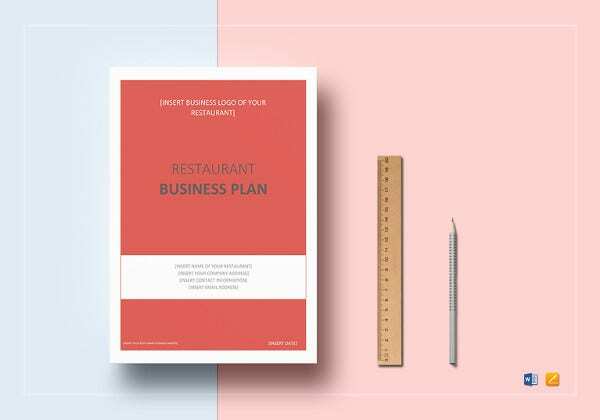 > What are the Benefits of Meal Planning Templates? 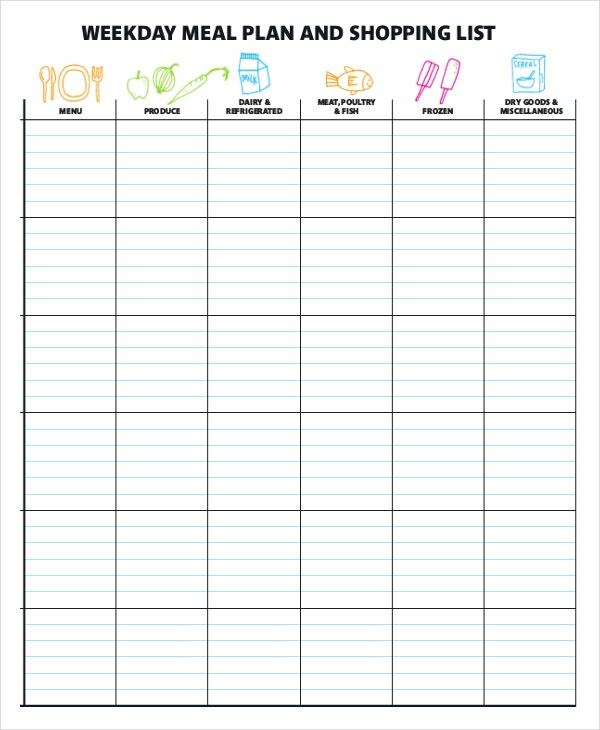 Meal planning Templates save your time when preparing for meals as well as shopping your food items. This is because they contain a list of all the things that you require in the right quantities. In addition, these templates assist in budgeting. When planning for the items to buy, you note their amounts and worth. Consequently, you plan your expenditure. This, in turn, encourages savings. What is more, they enable you to achieve your dieting targets. This is because the templates make you conscious of your calorie intake per serving. 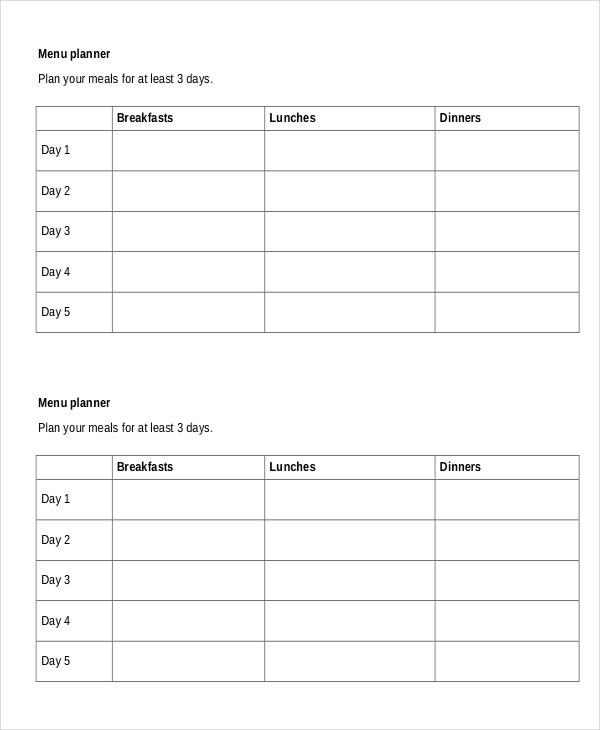 The daily meal planner template comes as a printable A-5 PDF document. Download and use it to prepare your grocery-shopping list. Note that it is printable but not editable. 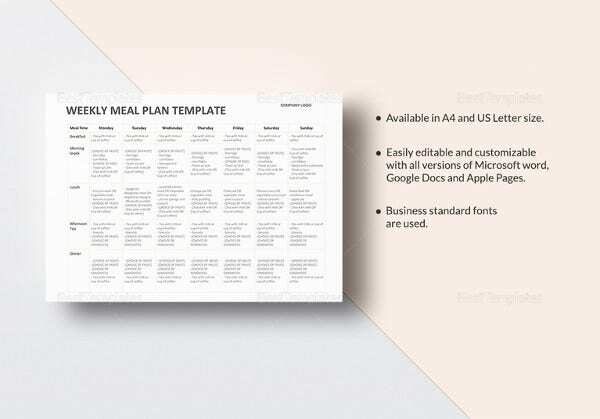 The blank weekly meal planner template contains proposed meals for breakfast, lunch, and dinner. 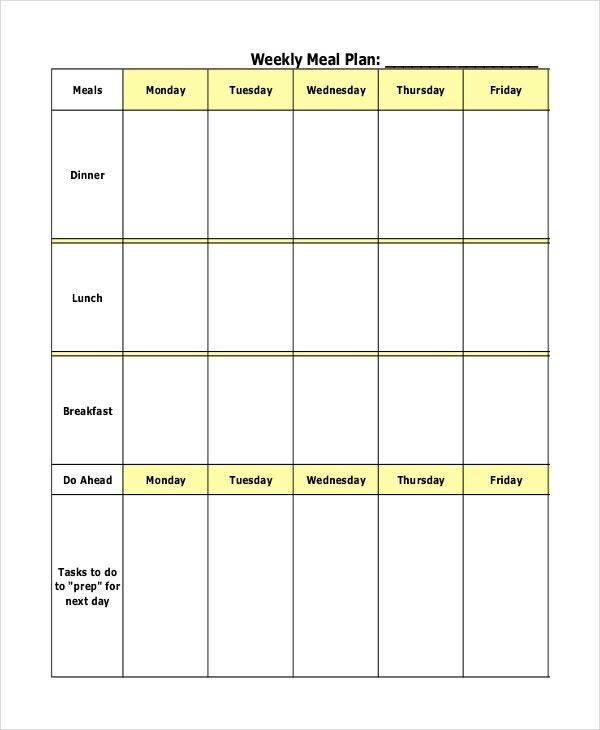 The printable file contains blank spaces for tasks to do in preparing for next day. The camping menu planner is available for download and printing in PDF format. It entails day’s column, a menu for breakfast, lunch, and dinner; grocery list, supply, and an elegant layout. 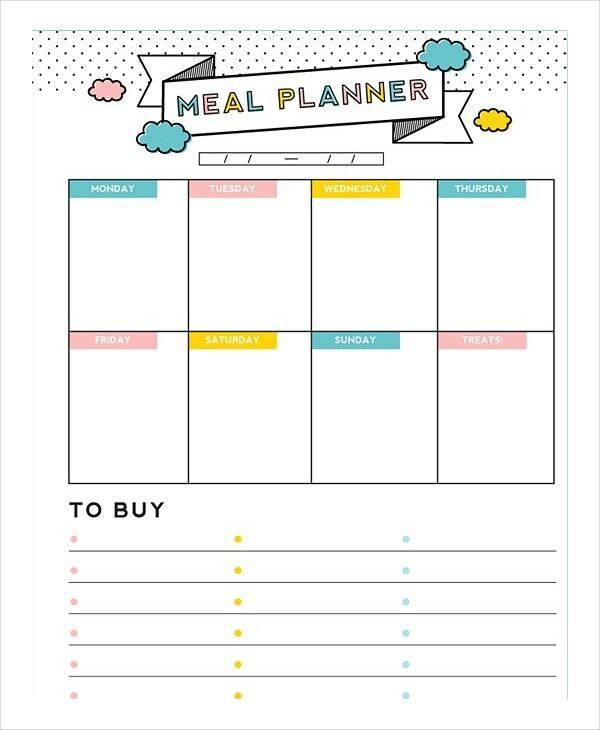 The weekday meal plan and shopping list schedule template comes as a PDF file in print –ready style. Although you cannot edit it, you can print and fill in its blank spaces. Most meal templates allow you to decide the quantities that you require for your ingredients. You are aware of your main meals, side dishes, and snacks for a desirable duration. 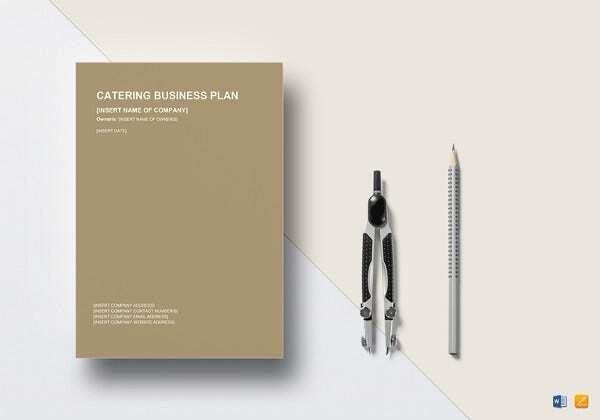 What is more, some templates come in a checklist format which aids in stocking your kitchen.